Abstract: The demand for more efficiency and productivity in the laboratory has led to applications using Fast GC-MS methods for routine analysis in a wide range of fields. Many of these applications can involve complex mixtures with some components at trace levels. The fast analysis time requires some unique capabilities, including a GC with fast column heating and cooling for high throughput, a mass spectrometer with high data acquisition speed, and a fast response ion source in order to correctly characterize narrow peaks generated by Fast GC. To make sense of the resulting compressed data, the software needs the capabilities of automatic peak finding and deconvolution of coeluting peaks to perform correct and meaningful identifications and quantitation. 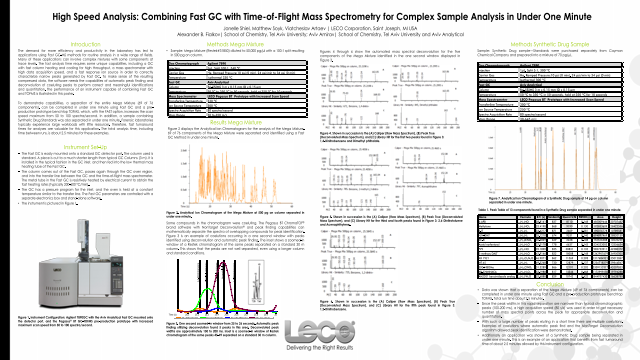 The performance of an instrument capable of combining Fast GC and TOFMS is illustrated in this poster. To demonstrate capabilities, a separation of the entire Mega Mixture (69 of 76 components), can be completed in under one minute using Fast GC and a pre-production prototype benchtop TOFMS, which, with the FAST option, increases the scan speed maximum from 50 to 100 spectra/second. In addition, a sample containing Synthetic Drug Standards was also separated in under one minute. Forensic laboratories typically experience large workloads with little resources, therefore, fast turnaround times for analyses are valuable for this application. The total analysis time, including time between runs, is about 2.5 minutes for these examples.Summary: Data was shown that a separation of the Mega Mixture (69 of 76 components) can be completed in under one minute using Fast GC and a pre-production prototype benchtop TOFMS. Total run time about 2.5 minutes.